Like many coaches, I got involved to support my football-obsessed son. I started helping out, enjoyed being involved and it developed from there. Two years in, I’ve got to know the boys very well and I’ve seen them develop in a relatively short space of time, which is very rewarding. Initially it was about supporting my own son but now I want to make sure that the time I give to the team sees all the boys develop positively in the way they play football as well as their attitude to the game and those around them. As a child of the 80's I completed the FA Superskills courses (Blue Badge through to Gold!). I assisted the lead coaches after finishing my badges during three consecutive summer holidays and then went to work in the USA as a Camp Counsellor with football as my specialist area. After this life took over and it is only after my eldest boy took up football at five years old I got drawn back into it some 20+ years later. The skills are not what they were but I think and hope I have a lot to offer the game as a coach who is keen and willing to learn. As I am relatively new to this, I am always looking to learn and take guidance along the way, but I bring with me a very clear idea of the values that I think are important when taking on the responsibility as a coach, role model and a mentor to young children. These are: Respect the opposition, your team mates, have a spirit of fair play, win well and lose well; Teamwork on and off the field as players and coaches; Enjoyment of the game - the friendships, training, participation and competition; Excellence - developing all players to ensure they achieve their relative potential with a good attitude to the game. Having ventured into coaching at a very early age, I have had plenty of role models to refer to and even as an adult I am watching and learning when I see other coaches in action. The best example of this would be those coaches in the Cambridge United youth development scheme, who I think are doing a great job in the local area. Becoming a parent helps you understand the positive and negative impact that you can have on a child and this highlights the level of responsibility we must have as a role model and mentor to the children we coach in football. I know what I want from coaches who train my son in other sports and I make sure I meet my own expected high standards. - Communication & demonstration. Adapting this for individuals and different age groups is very important to ensure you are conveying the key messages and learning points. Keep it simple and to the point and check they understand. - Listening. Listen and respond in the right way. Individuals need to be listened to and responded to at different times in different ways. - Feedback. Individuals need feedback in a constructive manner, which will help them develop with encouragement. - Observation & analysis. These are skills that allow you to focus on what the individual/team needs to work on and being able to break this down to help them work on improvements. - Motivation & facilitation. The team need to feel motivated to play their best and train to improve. The coach needs to support this through relevant training sessions and suitable competitions. - Flexibility. Sessions will not always go as planned but this should not stop you trying new things. Be brave! As a self-funded team, finances are always a challenge but we have good support from the club and our sponsors and we are lucky enough to have access to an astro pitch in the winter months to keep effective training going. While most managers and players demonstrate a good approach to the game, there are times you may come up against a team with a bad attitude, that is evident from the manager/coach through to the players. This is a challenge as often the boys can find this frustrating or indeed be affected by it in the game. Finally, probably my biggest challenge is managing a team with a variety of abilities and expectations. In short, setting training sessions that are inclusive and do not exclude players by being too easy or too challenging. I am still in the trial and error phase. I have piles of drills from different sources, some have worked well and some have not but may do in the future and I am still ‘stealing’ sessions whenever I see something new. 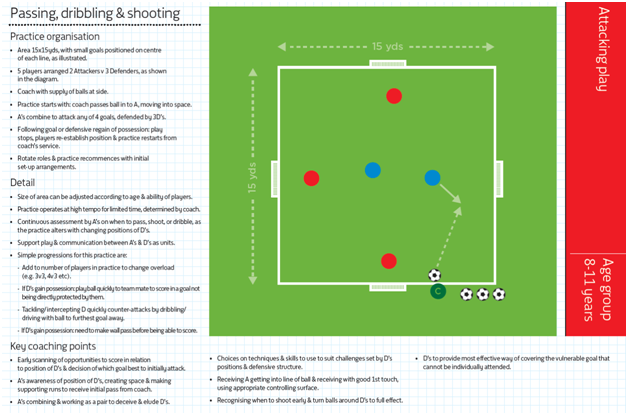 It is a bit early to pick one specific favourite session but this passing, dribbling and shooting drill that I use illustrates the type of drill I like to include in my sessions, which focuses on learning through game related activities making this more ‘real life’. The aim is to create a fun, sporting and respectful environment. There is no formal code of conduct and we want them to enjoy themselves. However, equally the children at training / match day must listen and be there to play football, so the discipline side is important. As the boys have got older this balance is getting better. I use my simple philosophy in practice, making sure they support each other as team mates, maintain mutual respect amongst each other and with their coaches. They enjoy what they are doing but also want to develop and improve as individuals and as a team. - Good movement, balance and hand eye coordination. - Positive approach to practice - focus on the more difficult skills as well as those that come easily. - Supportive to their team mates and coach. - Reflective with a willingness to learn. Very important! A lot of the coaches of today grew up playing in a way that is no longer considered the right way, thrown onto big pitches playing 11-a-side from a very early age. This means that coaches have to learn about this new approach to youth football as soon as possible so that, when they start the journey with their team at under-7 / under-8, they do so with the right framework and learning pathway. We have a lot of catching up to do in world terms and this work needs to start now with the long term in mind. This more scaled approach can only be a positive and I fully support this. I think things have already come a long way. However, my one message would be consistency, i.e. find the right formula, stick to it and make sure that the training and support in terms of opportunities and finance are there for grassroots football. Lets get it right and stick to it and don’t keep changing things. As mentioned before I am new to this set up and still learning. What I see is a lot of good intentions but also a lot of confusion and mixed messages. Once the pathway is clear and consistent and communicated we will see further improvements. 1. Enjoyment; 2. Development; 3. Winning. If a child enjoys playing football he/she will want to learn and develop as a player. If they develop as a player they will start to compete in games and they will start to win. There is a lot of debate around the focus on winning in football. My own personal view is it is not about winning at all costs but, because most young footballers I know are naturally competitive, we must not tell them this is not important as this can be confusing! My role as a coach is to ensure that they learn to win well, demonstrating positive sporting behaviour, accept losing when this happens and look at the positives from the game in terms of their development as a team and as individuals. This isn't a simple yes/no answer, as far as I am concerned. I have a squad of various abilities who contribute in different ways and we have a great team spirit. A coach with nine players all of equal ability may play equal time for all. I take the approach of using a minimum amount of time. The last thing I want is for a player to feel left out and I make sure this does not happen. My knowledge of the players strengths and weaknesses and the opposition allows me to make decisions on game time / positions, taking into account numerous factors to ensure I protect confidence and promote inclusion. I am always learning and I adapt as I go. For me the spirit and smiles amongst the players show I must be getting it right so far, but I will never be complacent and will always reflect on this if I think I did not get it right. In short, supporting the kids in their development as players and people. My experience of playing sport as a boy was very positive. It taught me new skills, gave me confidence and introduced me to new friends. I enjoy passing on my enthusiasm, what skills I have to offer and seeing my group of players enjoying their sport, making friends and feeling part of something. Sport can only be a positive for children and I want to be part of promoting and supporting that. Describe yourself as a coach in three words: Organised. Enthusiastic. Reflective. What professional manager/coach are you most like: Dario Gradi – committed, loyal, focused on fair play and youth development and here for the long run! If you could add any footballer (past or present) to your team: Zico - for his sublime skill and balance. As a boy growing up he was the player to watch. Describe your perfect team: The perfect team competes with style and confidence, while showing respect. Clinical passing with great execution in front of goal. Your proudest moment as a grassroots football coach: When one of our players, not known for his goalscoring, scored last season. The smile on his face and the excitement amongst his team mates on the bench and on the pitch was huge. I think the fact that the players were all so pleased for him and showed it through the best goal celebration of the season demonstrated the great team spirit and sense of unity they already have at such a young age. What do you think of the issues Matt has raised? Do you like his coaching philosophy? We'd love you to get involved and give us your feedback on the points raised in the comments section below. Tell us what you think!